Being petite with a longer torso and shorter legs I pretty much solely wear high waist denim. I feel better, it makes my legs look longer, and it has a vintage vibe that I’m all about. Finding good high waist denim can be challenging let alone it being sustainably made! I’ve created this list of the best of the best when it comes to sustainable + high waist denim! 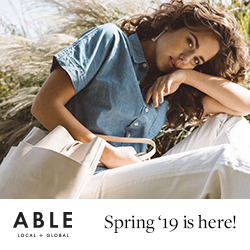 If you are new to the sustainable fashion world, Able is a brand that you should not miss! Well designed + stylish basics (total Madewell vibes) plus they are very affordable! I’m loving the Carla High Rise that even comes in a short style! 20% off if you sign up for their email address! This was one of my first non Everlane denim purchases (sustainably made that is) and I love them! I do wish I sized down since the pair I got, the Riley in Air Blue tend to stretch out. I will say they do not do a great job on sharing the sizing so I would read reviews to find the best fit for you! Check out my Agolde instagram post where I asked my followers to share about Agolde sizing, a ton of helpful info was added! They win the award for widest size range + most affordable + and they offer short, regular, tall. Yaaas! They are still an amazing jean (I’m just picky AF) and would work well for those that want affordable + sustainable denim! I will say I have yet to try their newest 90s cheeky style that looks like it would be a perfect fit for me but I am not in need of a new pair currently. Handmade in Nashville, TN they really have denim nailed down. The Catherine are very reminiscent of 1950s workwear that I love to mix with more frilly tops. Looking for a skinny? The Elizabeth. More known for her cotton canvas pants but do not miss her denim versions. She makes both the sailor pant and the ranger pant in denim and they are just as amazing as her canvas ones. Levis is stepping up their game when it comes to sustainablity, check out this article to read all about it! They no doubt have the best denim out their, and I’m glad to see that they are bringing back more vintage inspired cuts like their Ribcage Jean. An ultra high rise with a more 1950’s workwear inspired cut. Whoever came up with this idea is a damn genius. Taking old Levis and altering them to fit??? Not sure how they pull off this magic by constantly having that much in stock, but they do not come at a cheap price. Shop slowly and make sure you know you measurements (you should always do this) and you could have a perfect fitting pair of Levis for lyfe. I’m a huge fan of the ultra high rise crop (great for petites) ! I have not personally tested their denim but I do love their mission. Reformation is dedicated to lowering are their water + textile waste and use mostly deadstock fabrics for production. The Pierrot pant (a wide leg favorite) come in a denim that is 100% cotton. This pant has a great high rise and is handmade in Canada! A smaller company that works on a made to order bases so give them a little time when you order and know that your item will be specially made! I’m particularly fond of the Paradise High Rise loving the exposed white buttons. These are pretty steep in price but they are made with a blend of reg and organic cotton which is not something I see a ton of! Do some of these prices scare you? You could check out this particular blog post I wrote: “Are Jesse Kamm Pants Worth the $400 Price Tag”. Or shop for a more affordable pair from Madewell called them Emmet, not personally tested by me, but the are very cute and range from $89-$110. Not technically sustainably made, BUT something you are going to wear over and over agin IS sustainable in my book. Can I ask what size you wear in the Catherine jeans? Thanks! I actually do not own a pair! This is a stock photo from their site!